Download "Cosmic Dust in an Expanding Universe?" 2 Unlike classical physics allowing the atom to always have heat capacity, QM restricts the heat capacity of the atom to the macroscale. Classical physics at ambient and ISM temperatures noted by dotted lines at 300 and 2.7 K shows the macroscale corresponds to > 30 and 3000 microns, respectively. The QM heat capacity of NPs vanishes at < 0.1 microns at ambient temperature, although is significantly reduced for < 6 microns. In the ISM, the QM heat capacity of the atom vanishes even for much larger > 1 mm size particles Conservation of Energy In classical physics, heat transfer in NPs does not depend on their size allowing conservation of EM energy to always proceed by temperature changes. QM differs by requiring the heat capacity of NP atoms under EM confinement at ISM temperatures to vanish, and therefore the EM energy of the galaxy photon cannot be conserved by the usual change in temperature. Instead, conservation proceeds by the creation of EM radiation inside the NP by QED. QED as a mode of heat transfer depends on the high surface-to-volume ratios of nanostructures. A closely related mechanism is TIR standing for total internal reflection. In 1870, Tyndall showed light is trapped by TIR in the surface of a body if its RI is greater than that of the surroundings. RI stands for refractive index. However, TIR usually occurs in the surface of macroscopic bodies having low surface-to-volume ratios allowing absorbed EM energy to be absorbed throughout the volume of the body. 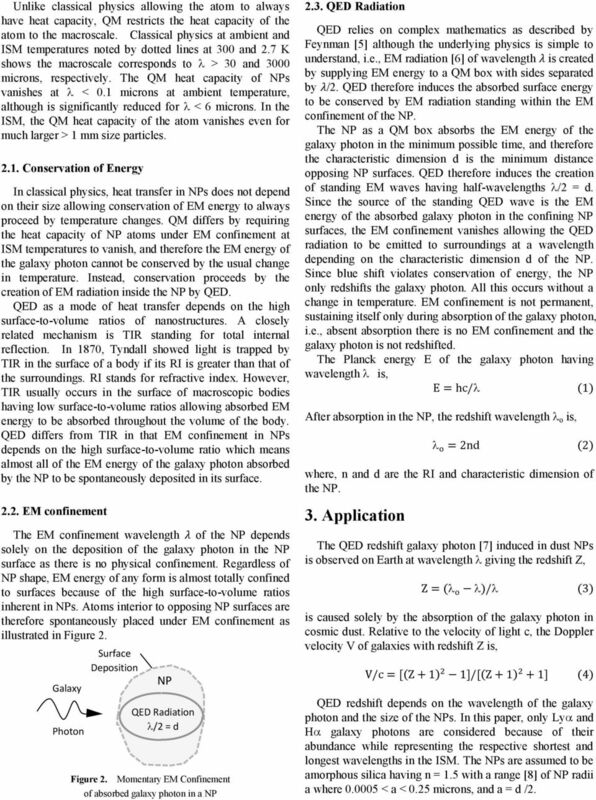 QED differs from TIR in that EM confinement in NPs depends on the high surface-to-volume ratio which means almost all of the EM energy of the galaxy photon absorbed by the NP to be spontaneously deposited in its surface EM confinement The EM confinement wavelength λ of the NP depends solely on the deposition of the galaxy photon in the NP surface as there is no physical confinement. Regardless of NP shape, EM energy of any form is almost totally confined to surfaces because of the high surface-to-volume ratios inherent in NPs. Atoms interior to opposing NP surfaces are therefore spontaneously placed under EM confinement as illustrated in Figure 2. Galaxy Photon Surface Deposition Figure 2. NP QED Radiation /2 = d Momentary EM Confinement of absorbed galaxy photon in a NP 2.3. QED Radiation QED relies on complex mathematics as described by Feynman  although the underlying physics is simple to understand, i.e., EM radiation  of wavelength λ is created by supplying EM energy to a QM box with sides separated by λ/2. QED therefore induces the absorbed surface energy to be conserved by EM radiation standing within the EM confinement of the NP. The NP as a QM box absorbs the EM energy of the galaxy photon in the minimum possible time, and therefore the characteristic dimension d is the minimum distance opposing NP surfaces. QED therefore induces the creation of standing EM waves having half-wavelengths /2 = d. Since the source of the standing QED wave is the EM energy of the absorbed galaxy photon in the confining NP surfaces, the EM confinement vanishes allowing the QED radiation to be emitted to surroundings at a wavelength depending on the characteristic dimension d of the NP. Since blue shift violates conservation of energy, the NP only redshifts the galaxy photon. All this occurs without a change in temperature. EM confinement is not permanent, sustaining itself only during absorption of the galaxy photon, i.e., absent absorption there is no EM confinement and the galaxy photon is not redshifted. 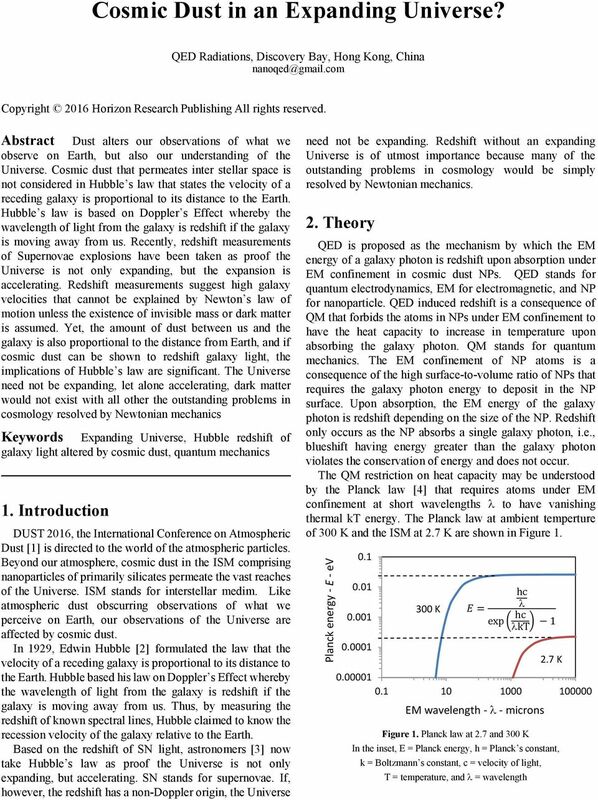 The Planck energy E of the galaxy photon having wavelength is, E = hc/ (1) After absorption in the NP, the redshift wavelength o is, o = 2nd (2) where, n and d are the RI and characteristic dimension of the NP. 3. Application The QED redshift galaxy photon  induced in dust NPs is observed on Earth at wavelength giving the redshift Z, Z = ( o )/ (3) is caused solely by the absorption of the galaxy photon in cosmic dust. Relative to the velocity of light c, the Doppler velocity V of galaxies with redshift Z is, V/c = [(Z + 1) 2 1]/[(Z + 1) 2 + 1] (4) QED redshift depends on the wavelength of the galaxy photon and the size of the NPs. In this paper, only Ly and H galaxy photons are considered because of their abundance while representing the respective shortest and longest wavelengths in the ISM. The NPs are assumed to be amorphous silica having n = 1.5 with a range  of NP radii a where < a < 0.25 microns, and a = d /2. 3 QED Redshift - Z Galaxy velocity ratio - V/c The QED redshift Z of Ly and H lines in dust and the galaxy velocity ratio V/c based on the Ly line is shown in Figure V/c 6 Ly : 0.6 Z = microns H 2 = microns 0.2 Z Cosmic NP radius - a - microns Figure 3. QED Induced Redshift of Ly and H lines Amorphous Silicate: n = 1.5 Unlike Hubble redshift where both Ly and H photons always have the same Z, QED redshift of Ly photons is far greater than that of H for the same NP radius, i.e., the Hubble redshift by the Doppler Effect gives the same Z for ALL wavelengths, but QED redshift in dust depends on wavelength. What this means is QED redshift allows an assessment of the validity  of the Hubble redshift if the Z s are not the same. Moreover, the galaxy velocity ratio V/c inferred by the Doppler redshift by dust may be a significant fraction of the velocity of light c making any astronomical measurement questionable as the galaxy need not be receding at all. Hence, cosmic dust most likely affects the accuracy of ALL astronomical ISM velocities inferred from Hubble redshift. 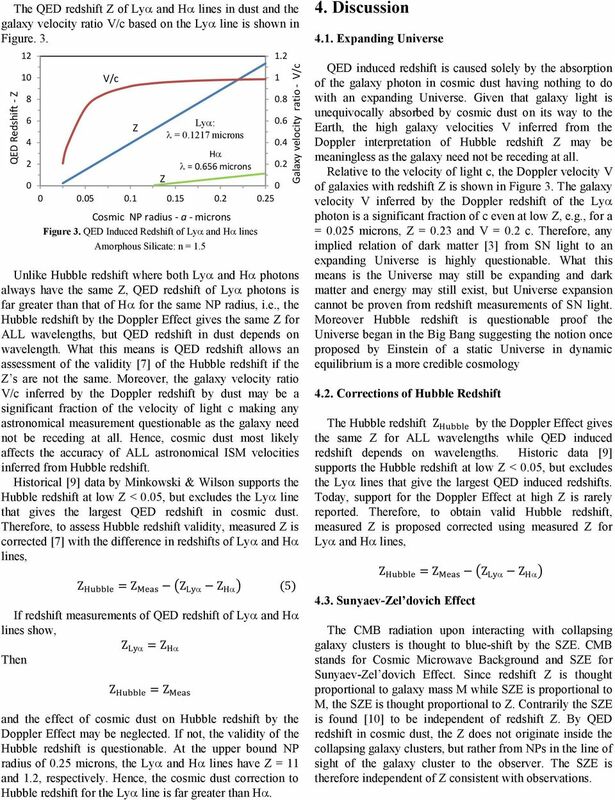 Historical  data by Minkowski & Wilson supports the Hubble redshift at low Z < 0.05, but excludes the Ly line that gives the largest QED redshift in cosmic dust. Therefore, to assess Hubble redshift validity, measured Z is corrected  with the difference in redshifts of Ly and H lines, Z Hubble = Z Meas (Z Ly Z H ) (5) If redshift measurements of QED redshift of Ly and H lines show, Z Ly = Z H Then Z Hubble = Z Meas and the effect of cosmic dust on Hubble redshift by the Doppler Effect may be neglected. If not, the validity of the Hubble redshift is questionable. At the upper bound NP radius of 0.25 microns, the Ly and H lines have Z = 11 and 1.2, respectively. Hence, the cosmic dust correction to Hubble redshift for the Ly line is far greater than H Discussion 4.1. Expanding Universe QED induced redshift is caused solely by the absorption of the galaxy photon in cosmic dust having nothing to do with an expanding Universe. Given that galaxy light is unequivocally absorbed by cosmic dust on its way to the Earth, the high galaxy velocities V inferred from the Doppler interpretation of Hubble redshift Z may be meaningless as the galaxy need not be receding at all. Relative to the velocity of light c, the Doppler velocity V of galaxies with redshift Z is shown in Figure 3. The galaxy velocity V inferred by the Doppler redshift of the Ly photon is a significant fraction of c even at low Z, e.g., for a = microns, Z = 0.23 and V = 0.2 c. Therefore, any implied relation of dark matter  from SN light to an expanding Universe is highly questionable. What this means is the Universe may still be expanding and dark matter and energy may still exist, but Universe expansion cannot be proven from redshift measurements of SN light. Moreover Hubble redshift is questionable proof the Universe began in the Big Bang suggesting the notion once proposed by Einstein of a static Universe in dynamic equilibrium is a more credible cosmology 4.2. Corrections of Hubble Redshift The Hubble redshift Z Hubble by the Doppler Effect gives the same Z for ALL wavelengths while QED induced redshift depends on wavelengths. Historic data  supports the Hubble redshift at low Z < 0.05, but excludes the Ly lines that give the largest QED induced redshifts. Today, support for the Doppler Effect at high Z is rarely reported. Therefore, to obtain valid Hubble redshift, measured Z is proposed corrected using measured Z for Ly and H lines, Z Hubble = Z Meas (Z Ly Z H ) 4.3. Sunyaev-Zel dovich Effect The CMB radiation upon interacting with collapsing galaxy clusters is thought to blue-shift by the SZE. CMB stands for Cosmic Microwave Background and SZE for Sunyaev-Zel dovich Effect. Since redshift Z is thought proportional to galaxy mass M while SZE is proportional to M, the SZE is thought proportional to Z. Contrarily the SZE is found  to be independent of redshift Z. By QED redshift in cosmic dust, the Z does not originate inside the collapsing galaxy clusters, but rather from NPs in the line of sight of the galaxy cluster to the observer. The SZE is therefore independent of Z consistent with observations. 4 4.4. Black-Hole Mass Astronomers based on the Doppler redshift measurements of stars orbiting black-holes infer 50 billion solar masses are required to allow the stars moving near the speed of light to stay in orbit. However, QED induced redshift Z in cosmic dust highly exaggerates the actual rotational speed of the stars. NPs of cosmic dust in the trailing debris of stars moving away from the observer suggest speeds approaching the velocity of light. Hence, the rotational speed of the star in orbit inferred from the Z Meas is highly exaggerated, thereby placing in question the presence of large solar masses in black-holes necessary to maintain the star in orbit. Z Meas of black hole masses needs to reviewed for a cosmic dust origin Supernovae Light Curves Time dilation of SN light curves  at low Z that take 20 days to decay will take 40 days to decay at Z = 1. SN stands for Supernovae. By QED redshift, Z is proportional to number of NPs that in turn is proportional to the mass M of the SN, i.e., Z is proportional to M. At Z = 1 the SN having larger dust mass M takes a longer time to cool than at low Z. What this means is time dilation observed in SN explosions inferred from Z Meas requires corrections for cosmic dust to avoid interpreting time dilation as Universe expansion instead the thermal cooling of the SN mass Tolman Test In 1930, Tolman proposed a test to determine whether the universe is expanding by measuring the brightness B of galaxies and redshift Z, but Tolman did not consider the brightness reduced by cosmic dust. Nevertheless, the Tolman test was interpreted by Lubin and Sandage  as the reality of Universe expansion. Recently, the brightness B of the aging of SN spectra was shown by Blondin, et al. to drop inversely with (1+Z). By QED redshift, the brightness Bo at the observer is. Bo = hc/ o, where o given by Equation (3) is wavelength at the observer caused by cosmic dust. But o = (1+Z) Bo = hc/(1+z). At the SN, the brightness B = hc/. Hence, B o = B/ (1+Z) and therefore QED redshift ion dust is consistent with the reduction in the brightness B of the SN spectra by (1+Z) Galaxy Rotation Problem Similar to black-holes, the galaxy rotation problem discovered in the 1960 s by Rubin and Ford  suggests dark mass exists at the center of the galaxies to hold them together under high rotational speeds inferred from Z Meas and interpreted by the Doppler Effect. However, measured redshifts need to be corrected for QED redshift in cosmic dust NPs depending on whether the galaxy is rotating away or toward the observer. Dust in galaxies moving away from us will show more redshift than that in the galaxy moving toward us, and therefore the rotational velocity based on Hubble redshift is far greater than it actually is. What this means is dark matter may not be necessary to hold the galaxies together. Indeed, Newtonian mechanics may resolve the galaxy rotation problem. Therefore, there would be no need to modify Newton s equations as in MOND to explain  how dark matter added to galaxies explains how they stay together at rotational speeds near the velocity of light. MOND stands for Modified Newtonian Dynamics Exoplanets Discovery of exoplanets in far reaches of galactic space is a daunting task because of inherently faint images. Similar to the problems of black hole mass and galaxy rotation, proof of discovery is based on high-precision spectroscopy  to measure variations in light intensity as the planet spins. When observing a spinning exoplanet, half of the planet rotates away from Earth, while the other half rotates toward Earth. The spectrum of the side spinning away from us will show redshift, whereas the side spinning toward us will show a spectral blueshift. The discovery by Oppenheimer et al. of 4 planets orbiting the distant star HR8799 supporting the theory that exoplanets surround other stars in the Universe is consistent with the planets that orbit our Sun. IR spectroscopic measurements of the suspected planets identified ammonia from 1450 to 1550 nm, acetylene from 1500 to 1550 nm, methane above 1650 nm, and possibly carbon dioxide from 1560 to 1630 nm, all of which are commonly observed in the atmospheres of planets in our solar system. However, molecular lines of carbon dioxide and methane should have been found in all 4 planets, but were only observed for 2 planets. In one planet, a weak carbon dioxide line initially not present appeared 4 months later. What this means is the spectra of HR8799 system are not likely produced by molecules on the planets. QED redshift suggests the molecules thought measured by IR spectroscopy are in fact redshifted Lyα photons having a wavelength depending on the size of the dust. Figure 3 shows NPs may produce near IR spectra similar to that of common molecules at high redshifts Z of Lyα photons, i.e., Z 11 at NP radius a = 0.25 microns. From Equation 3, the QED redshift wavelength o = (Z+1) 1460 nm which is comparable to ammonia at 1450 nm. Similarly, methane having wavelengths > 1650 nm would be observed at Z 14 and NP radii a microns which is a reasonable extension of known dust distributions in the ISM. Consistent with observation, the IR spectra has nothing to do with any molecular species, but highly likely depends on cosmic dust NPs. Hence, redshifted Lyα radiation in cosmic dust to the near IR could be interpreted as proof of exoplanet discovery - when in fact the exoplanet may not exist. 5 4.9. ISM Infrared Spectra Dust NPs are thought to emit EM radiation by thermal emission at near to far IR wavelengths from non-equilibrium heating by single galaxy photons. In 1976, Purcell  showed single-photon heating produces a temperature spike of 40 K in very small NPs (a < microns) so that much of the absorbed energy will be radiated in the far IR near 60 microns. Today, Li and Draine  are similarly proposing NPs heated by single galaxy photons are the source of IR spectra in the ISM. However, the notion that NPs heat-up upon absorption of a single galaxy photon is based on classical physics that allows the atom to have heat capacity. Contrarily, QM denies NP atoms under EM confinement the heat capacity to conserve the absorbed galaxy photon by a spike in temperature. Instead, QED produces IR in the ISM by redshift of Ly photons as described above for exoplanets without increasing the NP temperature. 3. Conclusions Humans know life has a beginning and an end, and it is only natural to think the Universe also has a beginning and end. Yet, for thousands of years, the Universe was considered static and infinite - without a beginning and end. However, Einstein in 1916 introduced his field equations that required the Universe to be finite and either contracting or expanding. Since a static Universe is foreign to human experience, Einstein provided a theoretical basis to suggest the Universe does indeed have a beginning and an end. But lacking experimental proof, Einstein s theory lay dormant until 1929 when Hubble dismissed a static Universe by showing the light from distant galaxies was redshift. Interpreted by the Doppler Effect, the Hubble redshift was taken as proof the Universe is finite and expanding consistent with human experience now supported by Einstein s field equations that continues to this day. 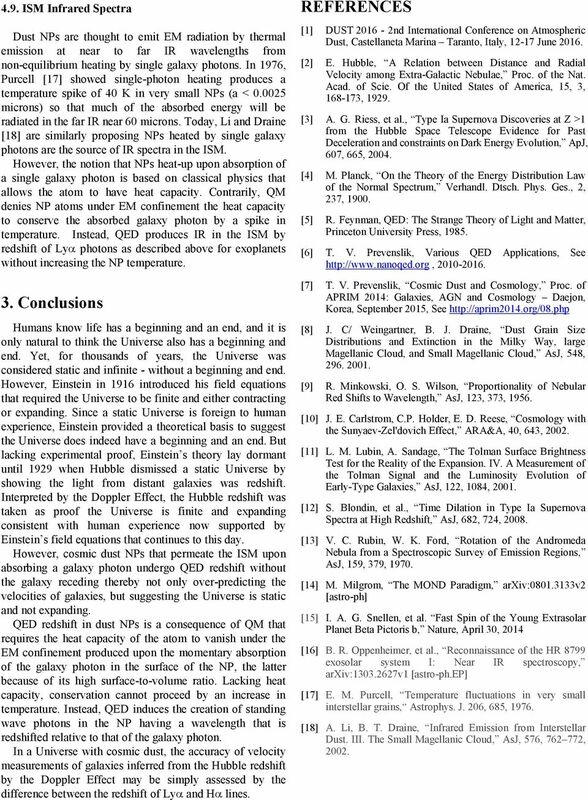 However, cosmic dust NPs that permeate the ISM upon absorbing a galaxy photon undergo QED redshift without the galaxy receding thereby not only over-predicting the velocities of galaxies, but suggesting the Universe is static and not expanding. QED redshift in dust NPs is a consequence of QM that requires the heat capacity of the atom to vanish under the EM confinement produced upon the momentary absorption of the galaxy photon in the surface of the NP, the latter because of its high surface-to-volume ratio. Lacking heat capacity, conservation cannot proceed by an increase in temperature. Instead, QED induces the creation of standing wave photons in the NP having a wavelength that is redshifted relative to that of the galaxy photon. In a Universe with cosmic dust, the accuracy of velocity measurements of galaxies inferred from the Hubble redshift by the Doppler Effect may be simply assessed by the difference between the redshift of Ly and H lines. REFERENCES  DUST nd International Conference on Atmospheric Dust, Castellaneta Marina Taranto, Italy, June  E. Hubble, A Relation between Distance and Radial Velocity among Extra-Galactic Nebulae, Proc. of the Nat. Acad. of Scie. 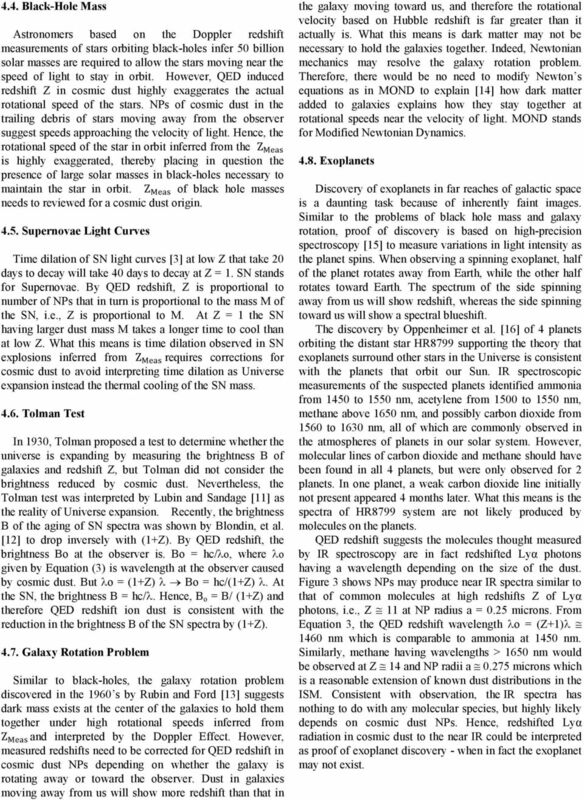 Of the United States of America, 15, 3, ,  A. G. Riess, et al., Type Ia Supernova Discoveries at Z >1 from the Hubble Space Telescope Evidence for Past Deceleration and constraints on Dark Energy Evolution, ApJ, 607, 665,  M. Planck, On the Theory of the Energy Distribution Law of the Normal Spectrum, Verhandl. Dtsch. Phys. Ges., 2, 237,  R. Feynman, QED: The Strange Theory of Light and Matter, Princeton University Press,  T. V. Prevenslik, Various QED Applications, See  T. V. Prevenslik, Cosmic Dust and Cosmology, Proc. of APRIM 2014: Galaxies, AGN and Cosmology Daejon, Korea, September 2015, See  J. C/ Weingartner, B. J. Draine, Dust Grain Size Distributions and Extinction in the Milky Way, large Magellanic Cloud, and Small Magellanic Cloud, AsJ, 548,  R. Minkowski, O. S. Wilson, Proportionality of Nebular Red Shifts to Wavelength, AsJ, 123, 373,  J. E. Carlstrom, C.P. Holder, E. D. Reese, Cosmology with the Sunyaev-Zel'dovich Effect, ARA&A, 40, 643,  L. M. Lubin, A. Sandage, The Tolman Surface Brightness Test for the Reality of the Expansion. IV. A Measurement of the Tolman Signal and the Luminosity Evolution of Early-Type Galaxies, AsJ, 122, 1084,  S. Blondin, et al., Time Dilation in Type Ia Supernova Spectra at High Redshift, AsJ, 682, 724,  V. C. Rubin, W. K. Ford, Rotation of the Andromeda Nebula from a Spectroscopic Survey of Emission Regions, AsJ, 159, 379,  M. Milgrom, The MOND Paradigm, arxiv: v2 [astro-ph]  I. A. G. Snellen, et al. Fast Spin of the Young Extrasolar Planet Beta Pictoris b, Nature, April 30, 2014  B. R. Oppenheimer, et al., Reconnaissance of the HR 8799 exosolar system I: Near IR spectroscopy, arxiv: v1 [astro-ph.ep]  E. M. Purcell, Temperature fluctuations in very small interstellar grains, Astrophys. J. 206, 685,  A. Li, B. T. Draine, Infrared Emission from Interstellar Dust. III. The Small Magellanic Cloud, AsJ, 576, , 2002.